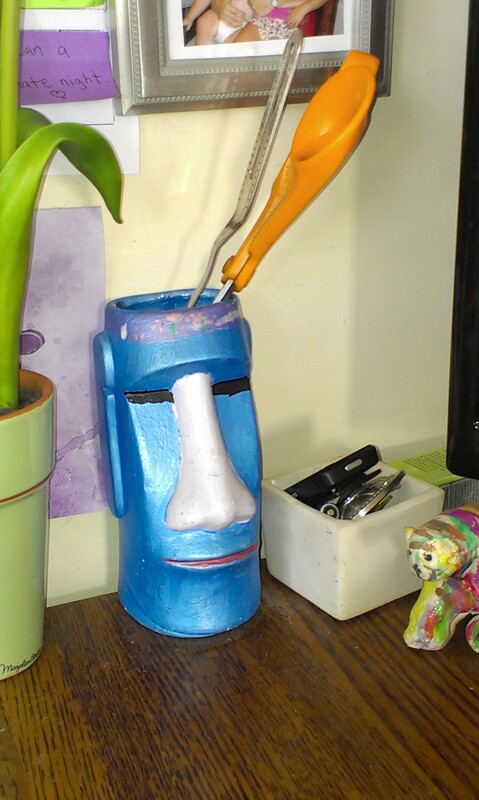 I think that if I were very, very wealthy, I would like to hire someone to take all of my last little bits of stuff. Those small slivers of soap melting on the shower shelf. The lotion at the bottom of the pump bottle that’s broken so that you can no longer pump the bottle, and instead you have to unscrew the top, churn the little dipstick-straw thing inside the bottle, and swipe it against your arm. The dishwashing machine detergent that only comes out if you store the container upside-down, and then the upside-down container falls over every time you open the cabinet, which usually knocks over a bunch of recyclables, too. The gummy, frosted clumps on the lid of the ice cream cartons. Never mind, I could probably handle the ice cream clumps myself. But the point is, I think that even if I were insanely wealthy, I still couldn’t just throw this stuff away. I’d feel guilty about the waste. But I’d find someone to take it. Hell, if I were unbelievably wealthy, maybe I could pay this person well enough that they could convincingly act grateful. They’d be all, “Oh, thank you! I was so, so hoping for 1/16 of a tube of acne cream, because the only thing I like better than a pimple is to spend 45 seconds of focused attention on coaxing pimple cream out of its container until I have way too much, and then I am Morally Compelled to spread the pimple cream on portions of my skin that are perfectly clear but considering breaking out. Especially if the cream has been expired for 7 months. This. Is. Awesome.” And then I’d be rid of something and feel like I’m making the world a better place for that one special employee. Currently this door is so adrift in snow that even its limited uses are well-nigh impossible. Meanwhile, the front door is used by people who just don’t know any better. To encourage the learning process, our doorbell only works roughly 30% of the time, so your chances of actually gaining access to the house via the front door are poor at best. I believe that we’ve replaced the doorbell once or twice already, so perhaps it’s possessed. But that front entry isn’t entirely useless! In the months of January and February, the small, ugly, linoleum-floored entrance way is transformed into a walk-in refrigerator. This is particularly convenient for soup and football season, so that our refrigerator isn’t overflowing with soup pots and beer. Sadly, it’s not usually this clean. 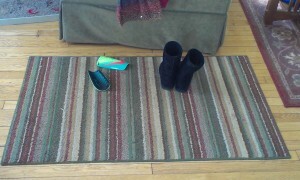 It tends to be a sloppy pit full of shoes, mittens, and bags. It’s lined with tons of hooks that are perfectly set for my children’s height and yet they seem to find it extraordinarily strenuous to actually make the motion required to hang anything from these hooks. This closet opens onto a teensy space right next to the downstairs bathroom. In fact, if you open the door to the bathroom wide enough, you can rig it so that you can’t actually enter the house, because the back door collides with the bathroom door. If you can believe it, there actually used to be a door in this doorway to the closet, too, but we only had to jam three doors together about five times before we knew something was coming off the hinges. And that leaves our screened porch door. This is just off the driveway, making it our favorite door for ride pick-ups and drop-offs. It’s our cat’s favorite door, and it’s where J has been tromping in every day after school, leaving a mess of melting snow behind her. After muttering darkly for weeks, I had the brainstorm that I should remove the area rug from our refrigerator-foyer and just set it down next to the screened porch until the end of snow and mud season. Which was the right decision. But it also feels like I’m surrendering, because it signals that I’ve officially given up trying to keep things contained in the back door closet area. 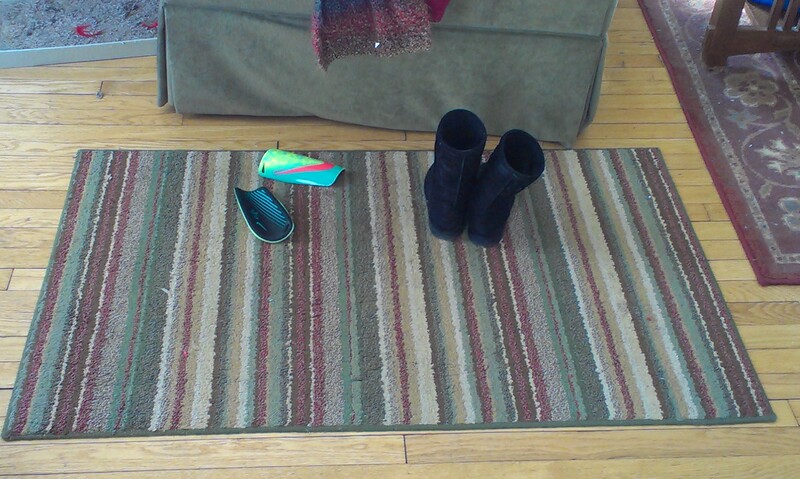 Sure enough, within a day of the rug move, boots, shinguards, and mittens had popped up there like mushrooms. I’m officially marking time until May, people. Note that there are still a pencil and pen randomly cluttering up the table, in spite of the super-conveniently located cup. 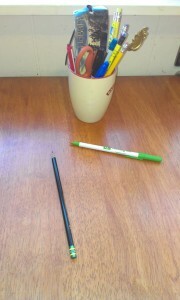 Which apparently is some sort of magnetized sucking vortex, because it’s accumulated pencils, pens, a marker, a letter opener, a bookmark, and a pair of scissors. And what does my pen/pencil cup look like, over on my desk? Completely writing-instrument-free. I am not even kidding about this one. Sigh. On a side note, I wanted to point out that I really have been keeping up with updating my Events page pretty well. So don’t forget to look. I haven’t added lists of links to the blog much lately, and I think that’s because I tend to share them via Facebook pages instead. The KidsOutAndAbout page gets most of my misc. parenting links, and the Working Group on Girls of Schenectady tends to get my girl power links. Unless they’re too profane. I feel your pain, Katie! About the lack of a mudroom, and the failure of family members to get with the program with the strategies we attempt to implement. 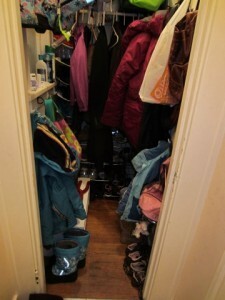 (Actually, I’m jealous that you have any downstairs closet, because I don’t (unless you count my basement stairwell). I too am biding my time till May. Normally I try to be a good sport about winter and save my complaining for when it’s 95 degrees out, but man! This winter is like none other! @Claire, you said it! It felt like January flew by, but February might kill me. I really enjoyed your post! I feel your pain! Thanks for sharing! I’ll keep following your blog! Greets!